Sputnik/Moscow: The right-wing Brazilian president, believed to be a staunch supporter of Israel and its Prime Minister Benjamin Netanyahu, sparked debates with his statement during Thursday’s meeting with evangelical pastors. He said that he believes the crimes of the Holocaust can be forgiven but measures must be taken so this never happens again. “We can forgive, but we cannot forget. That quote is mine. Those that forget their past are sentenced not to have a future”, he said, as cited by The Times of Israel, adding one should act to make sure that the Holocaust will never be repeated. 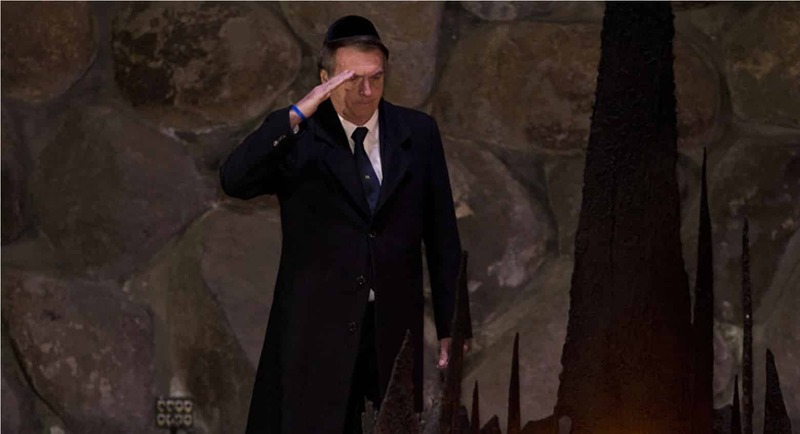 During his trip there, Bolsonaro, among other things, visited the Holocaust memorial. He and Netanyahu also signed a number of agreements, including papers on defence, cybersecurity, and police cooperation. Bolsonaro also announced his decision to open a trade office in Jerusalem in addition to his earlier pleas to move Brasilia’s embassy from the city from Tel Aviv. However, the latter move appears to be on hold, according to the Times report. The holocaust means the total burning which means everything burned up including the evidence that it ever happened. Maybe people should ask how the Nazis killed 6million Jews when there was less than 3million living in Europe? Seems to have been about 3+ million survivors after 1945 as well! Plus the work Camp Kapos went on to set up the terrorism which became Israel in 1948. ” Jews will always fight ” ..Oh BS ! First is to be a parasite then to freeload off the American taxpayer , every Jew in Israel should be a multi millionaire if all the perks and repatriations were added up . ” Jews will always fight ” Yes, to the last drop of American blood they will! So will the Israelis ever be forgiven for their genocide against te Palestinians? No, it will be remembered, as the truth. The other has proven out as the greatest falsehood of the last century, and 9/11 still requires a reckoning for this century. Does he want to kill the Shoa-Business ? “…the greatest holocaust in history.”???? If it is greater than the slaughter of 60 million indigenous Americans or 60 million white Christians in last century Russia; then why can’t this sacred event not be studied under any light over than the post WW2 version. A version that when held up to the light of truth seems to be made not of whole cloth, but rather a mosaic of half truths and out right lies held together only by laws that make it a crime in some country’s and political suicide in all countries to question Only such a frail and brittle version of history must be protected by laws. Laws created by threats and bribery. The Jewish holocaust happened as claimed or did not, but it’s not for free men to decide. What a sorry people.